The Infant/Kindergarten children, whom in September 2019 will be moving up to grade one have begun their Loom Weaving Project. This is a project which they will work on for the remainder of the school year. The looms used are simple wooden rectangular frames with vertical cotton strings. 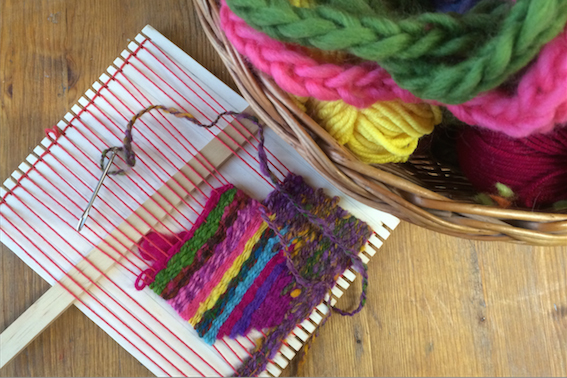 The children learn to slowly weave through coloured wool, combing each completed line as they proceed and paying careful attention not to skip strings, or pull too tightly. At the end of each chosen colour, they attach a new piece of wool (by knotting the two pieces together) to create a small multi-coloured rug of their own colour choices and overall design. Once complete, they will create a bag, by sowing it together, and attaching a button and a shoulder strap. This is a project which all children making the transition to primary education take part in at Sa Llavor. It is a transitional project, which takes them on a journey from the sowing activities they have been used to in the lower years of kindergarten through to knitting projects they will learn to master in year one. From a Holistic Pedagogy perspective, there are many reasons why this is an important craft activity for the children to undertake. By starting the project the children understand that they have begun a journey to take them into the the first year of Primary. They will be going to “big school”. Symbolically this weaving journey allows them the time to prepare for the changes ahead and they take great pride in being able to take part. But this is just one of the reasons for the project. All crafts projects undertaken within the Holistic teaching methodology, regardless of age/grade are both beautiful and functional. The fact that they are creating a bag, which they will then use; provides a great sense of autonomy and self confidence. From a physical aspect it allows the children to develop their fine motor skills. It is “fiddly” work and some can find this challenging at first. In addition to dexterity, it requires a queen eye, and considerable concentration and therefore also allows them to develop emotionally, by increasing their ability to concentrate and providing an environment where they can challenge themselves to achieve and overcome any difficulties they may face. Socially, it creates a stronger bond between the group of children that will be moving up to year one, as it is an activity and journey they are taking together. They sit together, help each other and occasionally chat to each other as they compare colour schemes and share the wool used for their respective master pieces. For the adult guiding the activity, it provides a wonderful moment to observe each child in turn, as they move through different developmental stages. How they develop their skills, tackle challenges, interact with each other. As teaching staff, we are able to provide further support, should any be needed and share the observations with parents and guardian as feedback for any concerns raised. All in all it is a wonderful and magical project, and we are enjoying it greatly. The young weavers in this years group are now well on way. They are enthusiastic and eager and a true inspiration. I wish them all good luck on their journey.